Both these areas of law protect accident victims. They provide the compensation these individuals and families need to move on. But personal injury law and workers’ compensation law come from different places, so there are some significant differences. Illinois personal injury law has its roots in court cases like Donoghue v. Stevenson. Beginning around 1900, courts set forth the duty of reasonable care. People who violate the duty of care, which is much like the Golden Rule that Rockford schoolchildren once learned, are legally responsible for the damages they cause. Workers’ compensation is about as old. Around 1900, factories were very dangerous places. So, workers and managers reached a compromise. Workers gave up their right to file legal damage claims in court, and management provided no-fault insurance that paid for economic losses. The so-called Grand Bargain became codified in Illinois law. A different part of negligence law applies to dangerous drugs and other defective products. In these cases, manufacturers are usually strictly liable for the damages their products cause. Victims need not prove fault or negligence. Damages are the same in both these workers’ compensation situations, as outlined below. Personal injury claims take place almost entirely under court supervision. The injured party files paperwork with the Winnebago County court. A judge hears any pretrial motions and supervises the discovery process. The judge also approves any settlement agreements and presides at trials. At trial, the victim/plaintiff must establish negligence by a preponderance of the evidence (more likely than not). Legal responsibility for damages and fault for the accident are sometimes, but not always, the same thing. Workers’ compensation, on the other hand, is an administrative process. The victim files a claim with the Workers’ Compensation Board. A hearing officer reviews the claim, and in most cases, the hearing officer also denies the claim. That’s just what they do. A Rockford workers’ compensation lawyer may appeal that decision to an administrative law judge. The ALJ hearing is a lot like a trial. Attorneys can introduce evidence, challenge evidence, and make legal arguments. As mentioned above, workers’ compensation insurance is no-fault insurance. It does not matter how careful, or how careless, the employer was. Victims need only prove causation. There are some procedural similarities. Over 95 percent of both workers’ compensation and personal injury claims settle out of court. Agreed settlements save time and money. They are also easier to enforce than court orders. So, in most cases, a settlement works best for everyone. 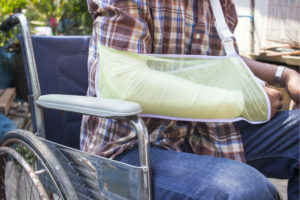 In personal injury cases, like car crashes or slip-and-fall injuries, most victims are entitled to both economic damages, for things like medical bills, and noneconomic damages, for things like pain and suffering. Additional punitive damages may be available as well, especially in defective product cases. Workers’ compensation claimants are usually restricted to economic losses. These losses include two-thirds of the victim’s average weekly wage for the duration of the disability. Permanently disabled victims usually receive alternative wage replacement. All victims are entitled to all reasonably necessary medical expenses. All kinds of injury victims may be entitled to significant compensation. For a free consultation with an experienced personal injury lawyer in Rockford, contact Fisk & Monteleone, Ltd. After-hours visits are available.